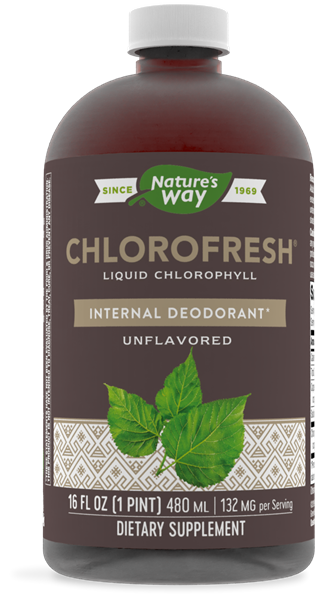 Chlorofresh® is a liquid chlorophyll complex extracted from a premium botanical that is used as an internal deodorant. * Chlorophyll is the pigment that gives plants and algae their green color. Nature's Way® chlorophyll is derived from white mulberry leaves. Adults & children age 12 and over: Take 2 Tablespoons, 1 or 2 times daily. Do not exceed recommended daily dose. Children under age 12: Consult a healthcare professional before use. For use as a Mouthwash, Rinse or Gargle: Use at full strength, or add 1-2 Tablespoons to 4 oz. glass of water. Rinse mouth thoroughly and repeat.